Featuring the best and most unique cards appearing in my 1000 Blank White Cards games. "The Code" and "The Bomb"
These two very interesting cards work in combination to reset the game. But the interesting part about them is that they require at least two players to agree to the reset. While interesting rules are all good, sometimes some good artwork can really spice up the game. 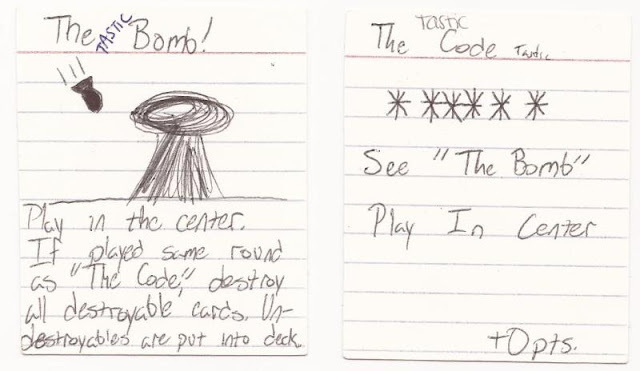 These cards all have to do with modifying and using the discard pile. It turns out that "Winter is Coming!" is a particularly useful card that inspired a whole bunch of things to do with all the extra cards in the discard pile. Things like "Grave Robber", "Night of the Living Dead", and "The Necromancer" are all examples of the kinds of things that can be done with a huge discard pile. Cards like "Brothers of the Nights Watch" can stem the tide, and also add a bit of theme to complement "Winter is Coming!". This series of cards were all inspired by "I Think!" (in the upper right-hand corner). 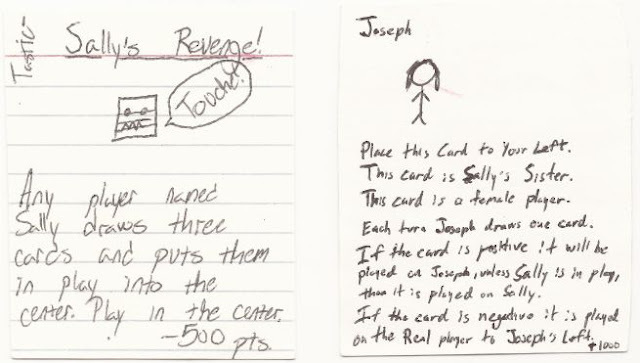 Each card has something to do with the creation of imaginary players, who sit between real players. Led to some very crazy things.